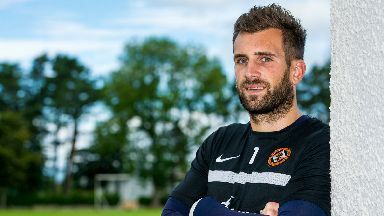 Cammy Bell's hat-trick of penalty saves for Dundee United against Dunfermline has drawn wide acclaim but won't be featured in the Guinness Book of Records. Bell was the hero of United's 3-1 win after he stopped spot-kicks from Gavin Reilly, Nicky Clark and Paul McMullan, with many believing he was the first goalkeeper to save a trio of penalties in the first half of a senior game. 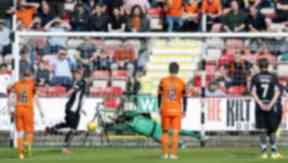 However, the Tannadice number one will not see his feat recorded in the famous record book after Guinness told STV they only recognise achievements in a country's top league. "Saving three penalties in one half of football is a fantastic achievement by Cammy Bell but unfortunately, due to the differing levels of professional football around the world, we only monitor records achieved in top division football," Guinness World Records' Amber Gill said. "No Guinness World Records title on this occasion but a hugely impressive feat nonetheless." Bell had the match ball signed by his team-mates after his remarkable feat and said that the match would go down as one of the most memorable of his career. "It is very special and probably will never happen again," he said. "The rest of the lads were great with me and they were all buzzing afterwards. "They were telling me that it was unbelievable and they'll never see anything like that again and I probably agree. "It is obviously up there as a highlight of my career. "There was the League Cup win with Kilmarnock when I had a great game that day but saving three penalties in a match is just unbelievable."